We’d love your help. 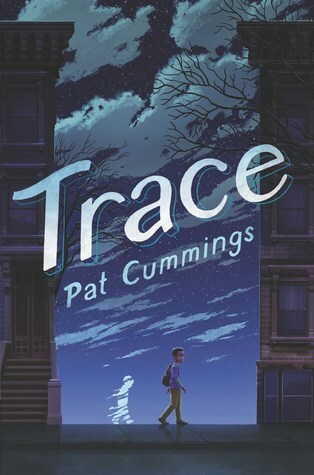 Let us know what’s wrong with this preview of Trace by Pat Cummings. Trace Carter doesn’t know how to feel at ease in his new life in New York. Even though his artsy Auntie Lea is cool, her brownstone still isn’t h In a debut novel that's perfect for fans of Jason Reynolds and Erin Entrada Kelly, award-winning author/illustrator and educator Pat Cummings tells a poignant story about grief, love, and the untold stories that echo across time. I got 2% in and the teacher being fat was mentioned 3 times. "The teacher had squeezed her wide hips into the swivel chair behind her desk, a chair that had long ago surrendered under the weight of her failed diets. Listing to one side, it creaked in pain as, with a weary sigh, the teacher leveled her eyes upon him and rested her chins atop the vase." I search her name and it's all about how disgusting she is that she got a cold. Yeah, this one isn't for me. Trace lives with his Auntie Lea in New York after the car accident that took his parents' lives and left him with PTSD and a lot of guilt. His aunt isn't a textbook parent, but she surrounds Trace with a support community and also makes sure that he sees Dr. Proctor, a therapist who is helping him with his grief. He has friends at school, and when his class is doing projects on the 1800s, he has a good group that includes his best friend Ty. When he goes to meet the group at the New York Public Library, he ends up in a restricted level, following a ragged four year old who is crying. Eventually, he meets a man named Dallas Houston who tells him that he, too, has seen the ghost of the child. When Ms. Levy, Trace's school librarian, mentions a fire at the Colored Orphanage Asylum that occurred during the time period his group is studying, Trace looks into it and realizes that Cholly might have perished in that event. Family papers from a great aunt's estate shed more light on Trace's family ties to it, and add a lot of interesting information to his project! Strengths: I had never heard of the Draft Riots, but now I want to find a nonfiction book on the topic! The history was woven into the narrative very nicely. I was very glad to see that for once, a grieving child is receiving therapy to help deal with problems. That is very, very rare. The friend group is nicely portrayed, and there is even a light romantic angle. Presley and her big words are quite fun, and I love that the teacher uses the word absquatulate, which was a favorite of my students from our word-a-day calendar this year! Weaknesses: This had a lot of coincidences that seem unlikely, and Trace at one point supposes that his aunt's friends might be lesbians in an odd, out-of-nowhere way. Starts out with a semi-typical kid surviving loss and massive displacement, getting used to a new school, but quickly introduces some genuinely creepy ghost encounters, that then weave throughout the book. Masterful storytelling that allows Trace's relationships to slowly unfold as he gets used to his new surroundings. Trace is a middle-schooler (12? I think? 6th or 7th grader? I can't remember if this was specified), who has just been picked to lead a group project on the the decade of US histo Starts out with a semi-typical kid surviving loss and massive displacement, getting used to a new school, but quickly introduces some genuinely creepy ghost encounters, that then weave throughout the book. Masterful storytelling that allows Trace's relationships to slowly unfold as he gets used to his new surroundings. Trace is a middle-schooler (12? I think? 6th or 7th grader? I can't remember if this was specified), who has just been picked to lead a group project on the the decade of US history in the 1860s. The group project ends up leading him to the New York Public Library, where Trace has an experience that alienates him from his classmates and shakes up his understanding of the world. I don't want to put spoilers in here, because there's some interesting and delicate plot shifts, and it's cool to see everything gradually connect. Highlights for me: Trace's colorful aunt, with her eclectic crowd of Brooklyn friends and her deep love of exploratory cooking; mean girl comeuppance; kids being kids in the awkward beginning of romance age; Trace's journey to healing as he comes to terms with the recent deaths of his parents and his own survival; particularly vivid and sometimes dreamlike scenes, beautifully conveyed; a really cool take on finding what interests you in history and making it relatable. Enjoyable read. I didn’t know much about the book before I started reading, but was soon pulled into Trace’s new life in Brooklyn following the death of his parents. I don’t want to spoil the mystery for you, suffice it to say, Cummings layers characters and clues throughout the story, inviting readers to make the leaps. Whether or not you see the resolution coming, you’ll be left feeling that life is well worth living, that it can be full and vibrant, and that it goes on. This doesn't feel like a debut novel. The pacing is excellent and it's ideal for middlegrade readers (especially around Halloween!). I love the supernatural aspect, though people who aren't fans of things that are scary or even horror-adjacent don't need to worry. I don't think anyone will be losing any sleep because of this book. Trace is an orphan now and of course he blames himself because he thinks it's his fault that he and his parents were on the road in the exact right time to get into the This doesn't feel like a debut novel. The pacing is excellent and it's ideal for middlegrade readers (especially around Halloween!). I love the supernatural aspect, though people who aren't fans of things that are scary or even horror-adjacent don't need to worry. I don't think anyone will be losing any sleep because of this book. Trace is an orphan now and of course he blames himself because he thinks it's his fault that he and his parents were on the road in the exact right time to get into the fatal accident. Because he doesn't really talk about his feelings, no adult in his life can reassure him that it's no one's fault. As much as I feel awful for Trace, he's sometimes hard to like. He makes a lot of really rude comments (in his head, at least) about people in his life. (Mostly his teacher but also Presley, a girl in his class.) This may be spot-on for boys in that age range; I don't personally know any so I can't say for sure. Trace is at a new middle school while living with his aunt in NYC. He wakes up nightly dreaming of the accident that took his parents. While in the library doing research, he hears a child crying. Investigating this, working with his school group, and meeting all sorts of people his aunt brings home, things slowly start to even out and Trace finds he is finally sleeping again. Borderline YA/MG - Trace is a bit old for MG but content and theme wise, upper elementary could handle it. Some kissing, Trace is at a new middle school while living with his aunt in NYC. He wakes up nightly dreaming of the accident that took his parents. While in the library doing research, he hears a child crying. Investigating this, working with his school group, and meeting all sorts of people his aunt brings home, things slowly start to even out and Trace finds he is finally sleeping again.